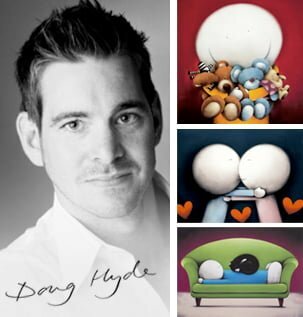 Buy Limited Edition Danielle O'Connor Akiyama Prints, Sculptures & Paintings. 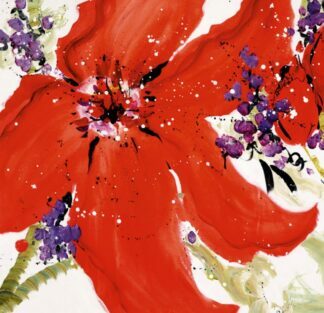 Danielle O’Connor Akiyama has enjoyed major international success as an artist for over 30 years. Her exquisite floral pieces have been exhibited worldwide and has received many prestigious awards. She was named President’s 1st Choice at the Florence Biennale of 2009, and ‘Best New Artist’, at the UK’s Fine Art Trade Guild awards of 2011. Danielle was born into a small community of just 22 homes in Toronto Canada. An environment which provided her with both freedom and serenity. With her mother and two of her sisters’ painters. she grew up with art being a part of her daily life. This meant for Danielle it wasn’t “crazily special to become a painter, just something you do”. She credits her mother with teaching her courage. The courage to attack the paper or canvas and to embrace it fully and go with full intention. That sense of bravery has always stayed with Danielle, and in this fearless approach to painting she found an inner peace. A large part of Danielle’s inspiration for her work comes from her lifelong habit of travel. Her paintings tell stories of her travels and of the people she meets. This love of travel started in her teens, when an illness led to her travelling the world as a natural rehabilitation. It also marked the start of a deep connection for Danielle between art and spiritual insight. She went on to train as an art therapist. Her clients used multiple art forms to connect with their emotions, rather than verbal intellectualism. This understanding of psychology has had a profound influence on her inspirational paintings and has been the foundation for her creations. Danielle also studied Sumi-e (Japanese Brush Painting) and was honoured with the Sumi-e Master’s Seal by the head sensei of the Nanga School. (hence the red chopmark on each original). The name given in recognition of her spirited brushstroke was “chi-sho”- a source of joy. This sense of joy is something she includes in her pieces and wishes to share with the world. Married in 1987, and a mother to two small children. She decided to follow her true path and began painting in earnest. The family moved to New York City, and her signature style of East/West fusion began to blossom. Although watercolour remains a favourite, she likes to work with different mediums including acrylic and oil. Danielle often also brings in other elements such as handmade Japanese papers. Also minerals from the earth and even diamond dust from Tiffany’s in Canada. She has exhibited her stunning floral masterpieces to great acclaim all over the world with Her distinctive fusion of eastern and western artistry has led to her works being highly prized by collectors from both sides of the Pacific. 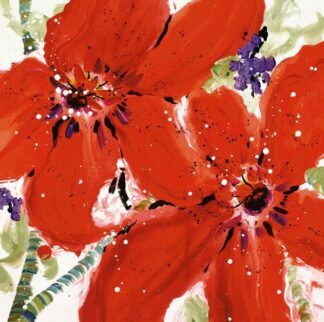 Collectors Prints are delighted to be able to offer our customers a range of Danielle O’Connor Akiyama’s hand embellished paper and canvas prints. As well as her book Illumination, a beautiful retrospective of an extraordinary artist and a captivating woman.